under respected judge Keke Kahn. A very special thank you to Karen Churchill his breeder/co-owner and Nancy Ingalls his handler for their efforts in obtaining his final points. Above Carson with friend and handler Jorge Pinzon. 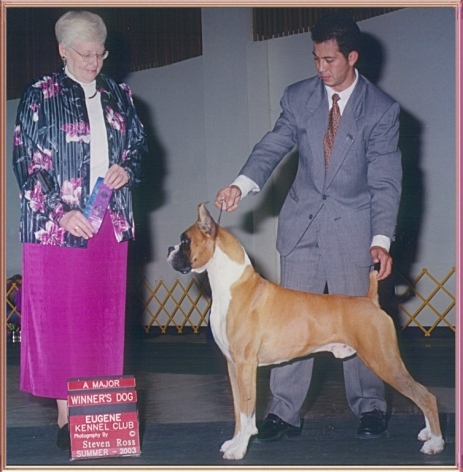 The five point major win (Rose City Cluster 2003)below was an owner/handled win against many nice dogs and handlers. Carson has an excellent structure. He can jump four feet sideways from a standstill. He does so to get in and out of my living room. 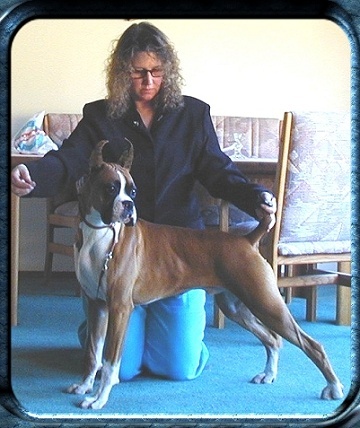 He has an excellent bite, double dark haws, flat top line and high tail set. His movement is pure poetry. It takes a very athletic handler to show him properly and that isn’t me. At least not anymore. Below Seven Month Old Carson "A Work In Progress"
Below a owner/handlers dream. A huge five point major. (The biggest major available in showing dogs.) There are three & four point majors also. 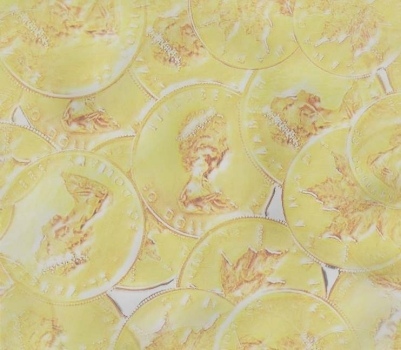 Five point majors are rare for at least this owner handler. 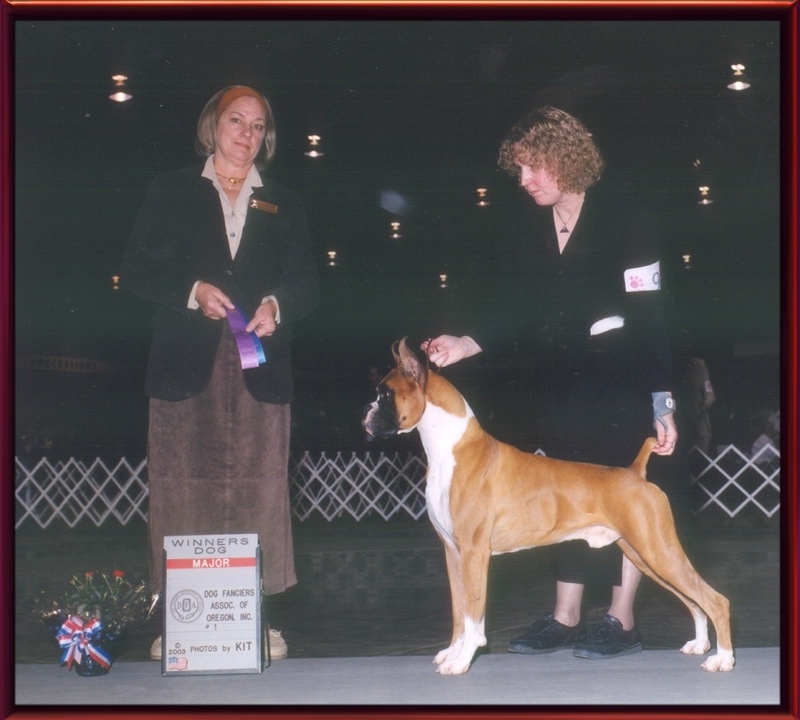 A dog must get two major wins to finish his AKC championship. The amount of points depends on the number of dogs defeated. In each breed the number is different. 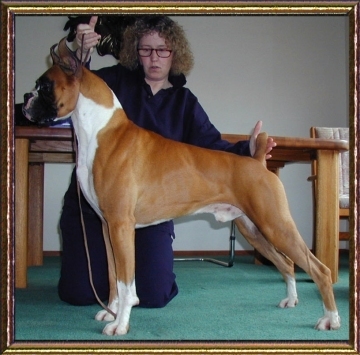 The dog must accumulate a total of 15 points including the two majors to obtain the title of Champion. The road to the completion of a championship is sometimes very difficult. It can take several years. The preparation, training, grooming, travel, dedication and tenacity are sometimes overwhelming. The wins often few and far between.